Tori McNair swimming the butterfly in the 200-meter medley relay during Knox Area Middle School Swim League “City Meet” Championships in the University of Tennessee’s Allan Jones Aquatic Center Sunday, Jan. 27. 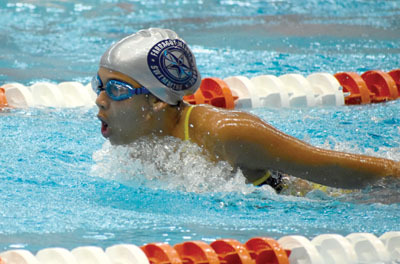 Farragut Middle School swim & dive team’s undefeated dual-meet season, 3-0, culminated with a first-place finish at the Knox-area Middle School Swim League “City Meet” Championships Friday, Jan. 25 (diving) and Sunday, Jan. 27 (swimming) in the University of Tennessee’s Allan Jones Aquatic Center. With eight first-place event finishes while breaking five team records, head coach Corey Snyder’s 90-member FMS team bested 20 other Knox area teams by scoring 703 points (300 more than the runner-up) and the most points ever in the five-year history of the meet. Snyder is assisted by coaches Trecy Rochelle, Claire Rowcliffe and Maddie Stephens.